Wolfgang Gartner has a knack for speaking his mind, especially via his Twitter account, and while listening to a still-unnamed fellow DJ on the decks, he went on a rant, expressing his views about the lack of experimentation in some DJ&apos;s selection. He detailed how the DJ was essentially playing the "Beatport Top 10" during this festival stop in El Paso, giving way to an interesting debate that doesn&apos;t get brought up nearly enough: While you&apos;re playing for tens of thousands of people, should you stick to "the hits," or should you be testing out different sounds, or is there some kind of balance that should be met? The beginning of the GQ article on Avicii showed how Avicii got pissed that the opener was playing a number of tracks he&apos;d predetermined for his own set, with A-Trak going on a similar rant about DJs not being "robots." 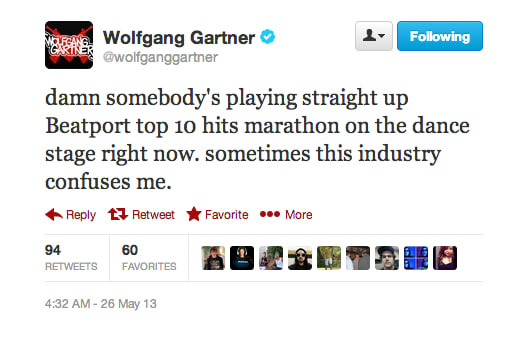 While Wolfgang Gartner didn&apos;t mention any names, Martin Solveig figured that Wolfgang was talking about his set that night, and took to his own Twitter timeline to speak his mind about his DJ selection and the reasons he&apos;s playing the big tracks and anthems that people want to hear. There&apos;s definitely a case to be made, although we like the idea of peppering in some lesser-known tracks. A great DJ should educate the crowd, right? In any case, during Wolfgang&apos;s tirade, he mentioned that he was possibly going on hiatus, and as you see up above, his management now has control of his Twitter account until sometime in June. Maybe Wolfgang just needed a cooling off period? Social media can make it easier to express oneself, removing the filter between your thoughts and your words, but fair play to Wolfgang for recognizing that and removing himself before he went off the deep end.